Jessica Norton is a woman on the run, a sensational lead item on the nightly news. Jon Harper is a grieving father whose life has crumbled over the death of his young daughter. When Jon picks up Jess hitchhiking on a deserted Texas highway one rainy night, it pitches them both into the middle of a massive conspiracy, one that threatens the very future of the United States. 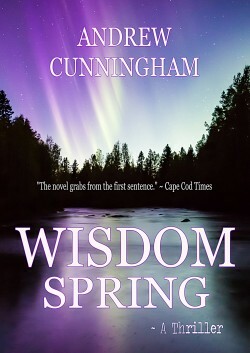 Part political thriller and part chase novel, Wisdom Spring takes readers on a fast-paced, suspenseful ride along the highways of the U.S. and Canada, and into the far reaches of the Alaskan wilderness. Along the way, the two unlikely heroes transition from helpless prey to proficient hunters, leading to a final violent confrontation with corrupt forces at the highest levels of government.